The Jordan Eikona Transmission Line Array was published on our blog in December, after more than two years of development. The design has already proven popular, with several builds in progress. The prototypes were constructed by Ian, one of our new Eikona demonstrators and a member of the LencoHeaven forum. He has demonstrated the TLAs to a number of LencoHeaven members and the feedback has been extremely positive. We have collated a page of their listening impressions, which you can read here. 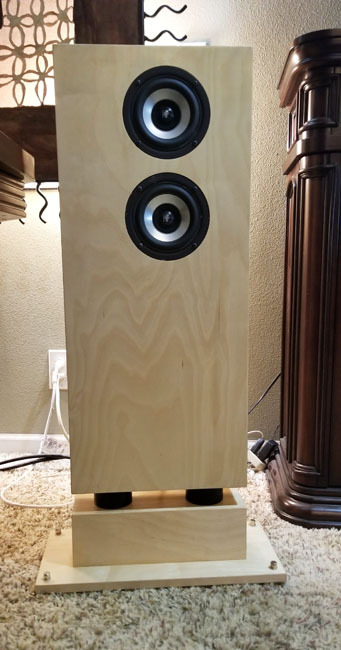 Meanwhile, we had an interesting request from Rob, a US customer who wanted to build an Eikona loudspeaker that was a little different. He was keen to build a pentagonal enclosure, having seen Simon Regan’s craftsman build. In discussion, we quickly narrowed the decision to an Array of four Eikonas, to get the required sensitivity for his low-powered SET tube amps (and also because he was attracted to the enhanced stereo imaging of the line source format). The next question was – which of our cabinet alignments would best suit his requirements? Rob wanted the loudspeaker to be able to convey the weight of a double bass (the five-string instrument goes down to 31 Hz) so we settled on the TL Array. Compared to the standard, rectangular cabinet, it is a more challenging construction project but the pentagon is aesthetically more interesting and its non-parallel cabinet walls reduce internal resonances. Placing the line divider at an angle is particularly effective at reducing reflections from the back of the Eikonas. Click on the image at the top of this page for a closer view of the plan. 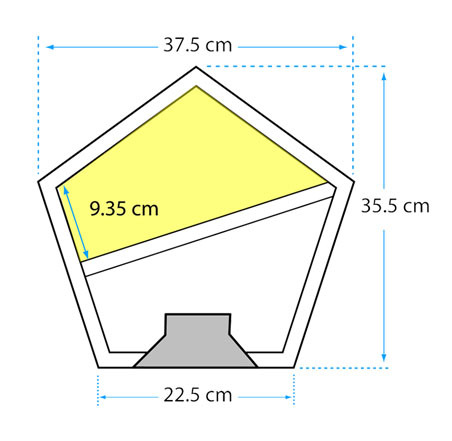 The Pentagonal design has also been added to the TL Array Design Guide, which is available as a high-res PDF here. Rob has begun work on his enclosures and we will publish photographs and his listening impressions as soon as they are available. Bright, cheerful and colourful. 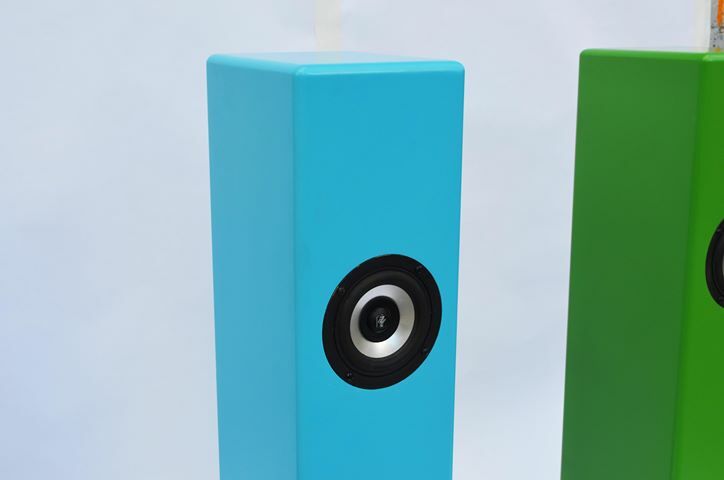 These loudspeakers will make you smile before you’ve even heard them. 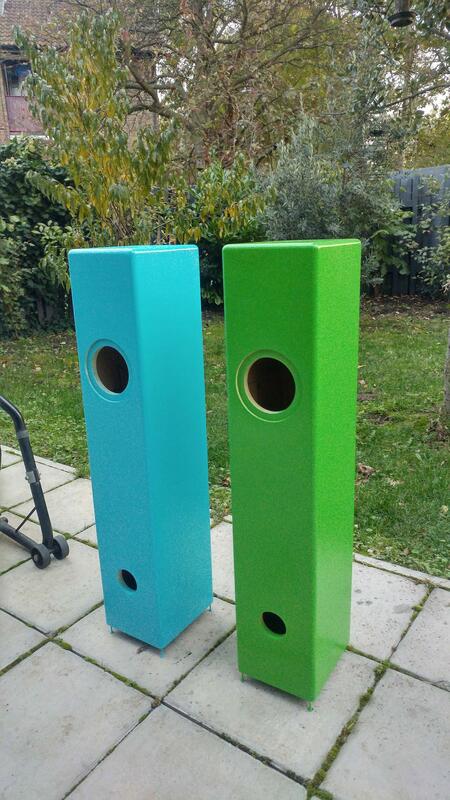 Colour isn’t usually a good attribute to have in a loudspeaker. 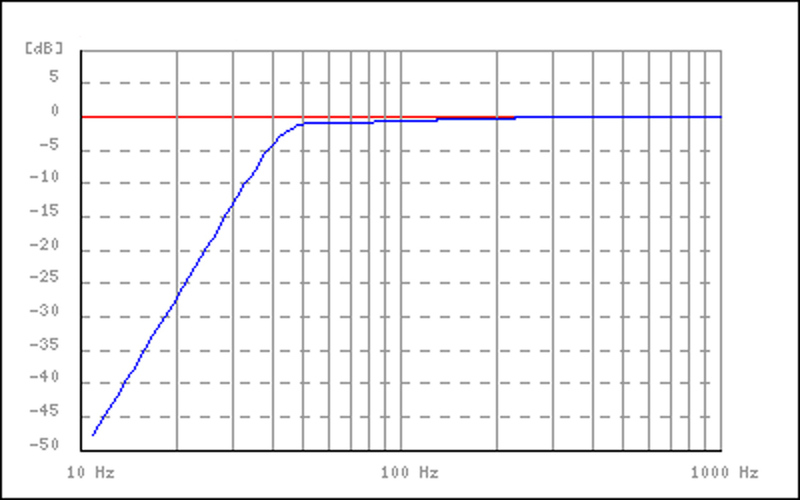 It implies harmonic distortion or, at the very least, an imbalance to the frequency response. 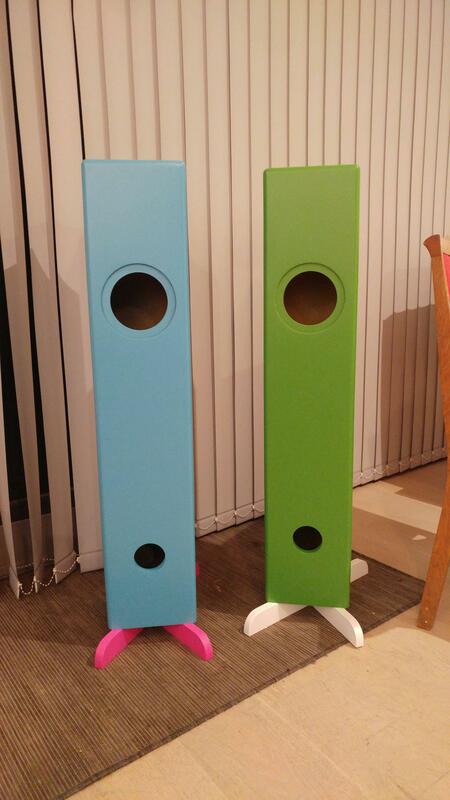 However, this new loudspeaker from furniture designer Archie Hands has colour in abundance and on this occasion, it’s a good thing. Archie first got in touch a year ago and purchased a pair of Eikonas. 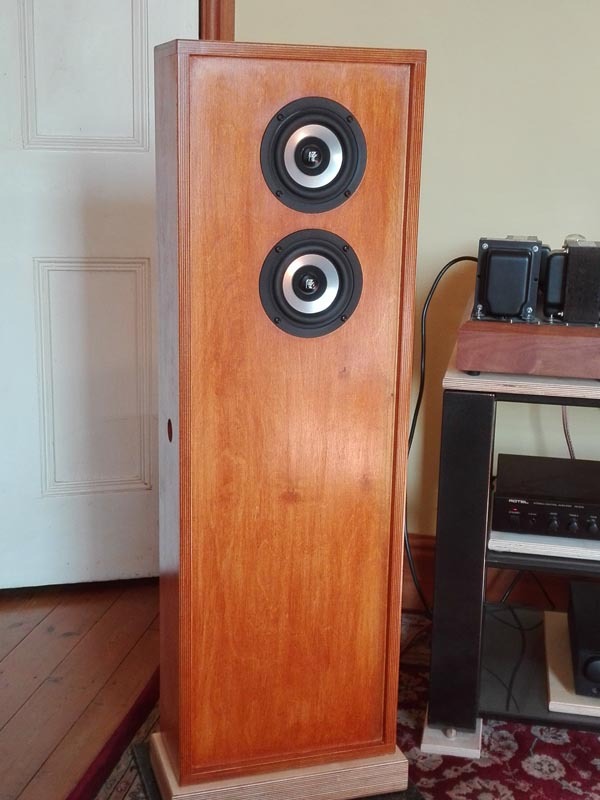 He went quiet for a while and then a few weeks ago came back with these photographs of his Eikona MLTL38 loudspeakers. 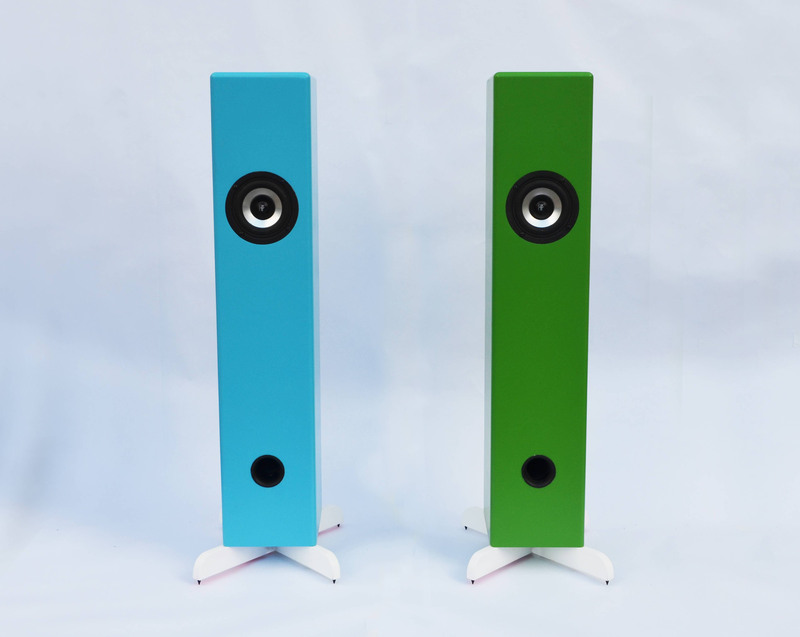 We think they look great and are particularly pleased to see that he’s made each speaker in the pair a different colour. It’s bold, fun and unusual. The MLTL38 is a mass-loaded transmission line (in reality, it’s like a cross between a reflex and a transmission line but the name has stuck). It gives a good output to below 30 Hz and you can find the plans on our website here. Archie has built the cabinets from Valchromat, a development of MDF with some unique properties; not least the fact that the colour is built into the material. No need for paint or veneer and the colour is not affected by dents or scratches. 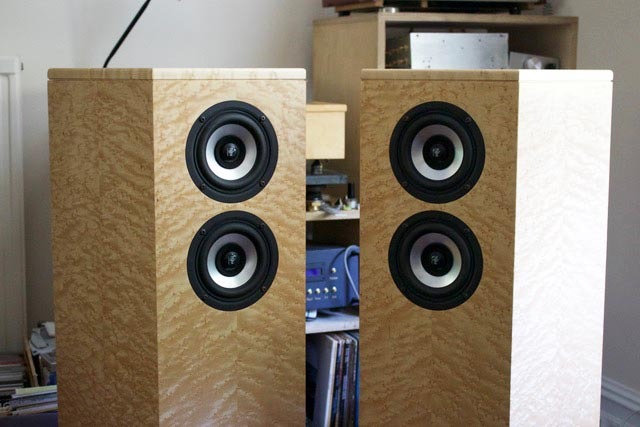 You can find the plans for the Eikona MLTL38 loudspeakers here. 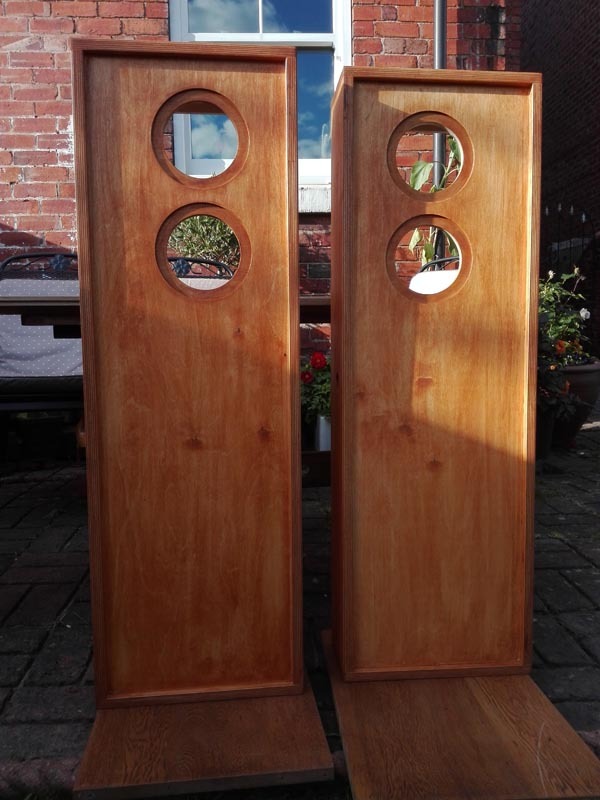 Archie is a professional furniture maker and is open to commissions from anyone interested in having a pair of loudspeakers built by him. Contact him via his website here. 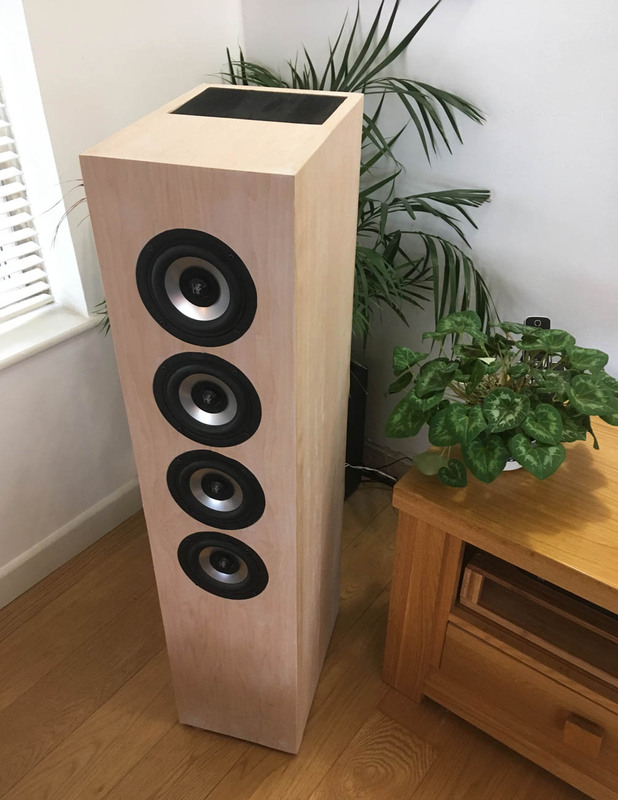 The Eikona SL is a compact, floor-standing loudspeaker which takes its inspiration from Ted Jordan’s VTL enclosure whilst being smaller, more room-friendly and easier to build (for more in-depth information, please see our Eikona SL blog. We decided to release the SL in two versions, the SL-A with sloping baffle and SL-B with a more conventional vertical front panel. 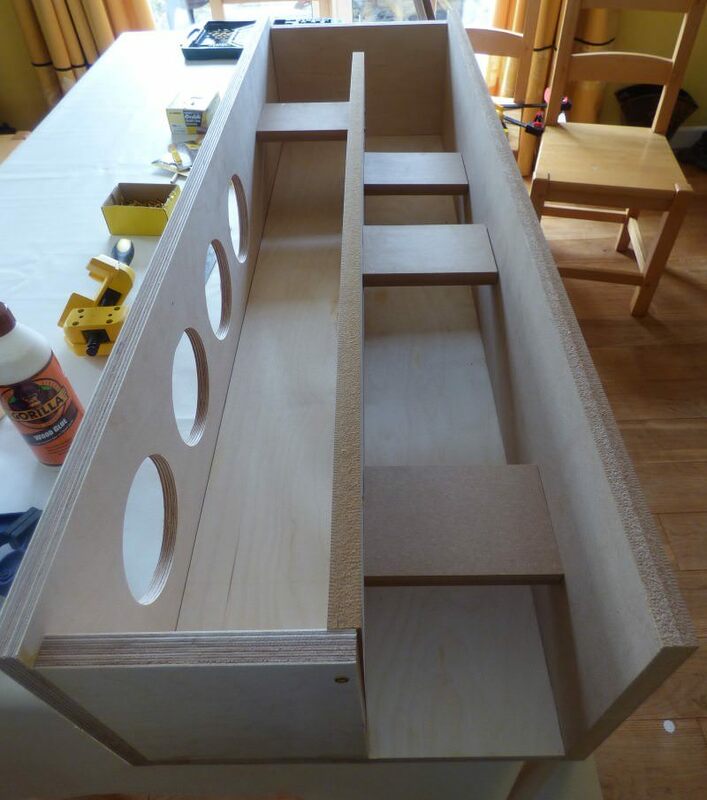 Below are some photos of a build of the SL-B enclosure. It was initially finished in dark grey and was then fully veneered. 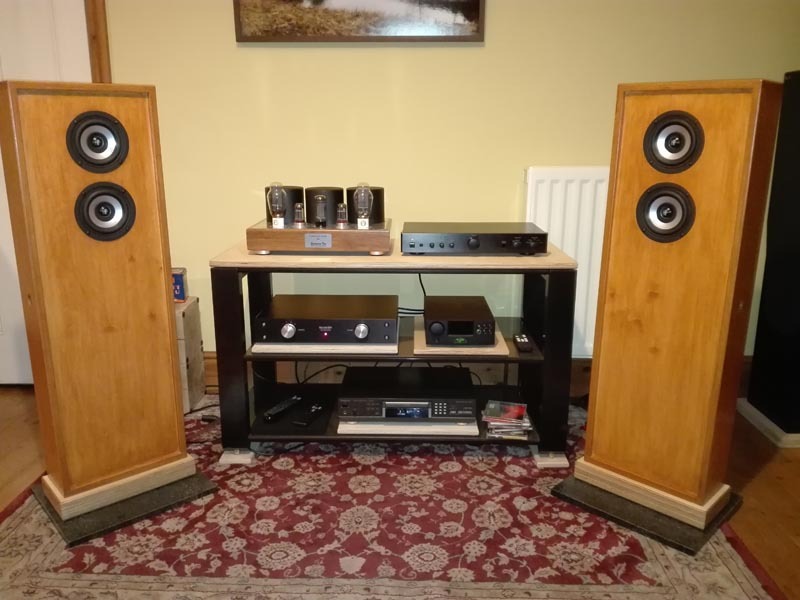 “I’ve been listening to the SL Eikonas for nearly three hours now … I went through my usual list of test tracks and to be honest I was gobsmacked! OK, they don’t have the weight in the bass of the TL’s nor the effortless dynamics, push the little SL’s hard and they’ll get a little ragged. At sensible – quite loud – levels, tracks like Massive Attack’s Angel sound excellent while gentler stuff like Emiliana Torrini’s Fisherman’s Woman LP sounds quite sublime. If anything, imaging from the SL’s is a bit better than the 4 driver TL’s and the soundstage is ridiculously big for such small speakers with bags of width and depth. “I ended up putting Karine Polwart’s new album, Laws of Motion, on and sat there totally enthralled by what I was hearing. If you don’t know this album but like a bit of modern folk then you should try this one. Karine has a beautiful voice and the instrumentation behind is quite excellent. To read more about the Eikona SL and download the plans, click here. “I first learned of Jordan Eikona drivers from the great thread over at Lencoheaven. “I work in construction and the challenge of building some cabinets appealed. The driver cut outs are really the tricky part. 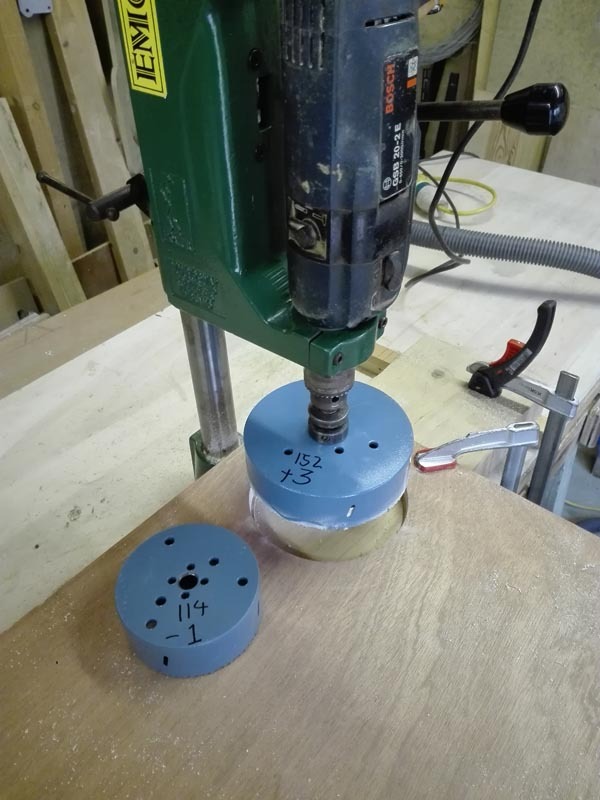 Holesaws in a pillar drill provide a starting point. This cut is then improved with a bearing-guided router bit. 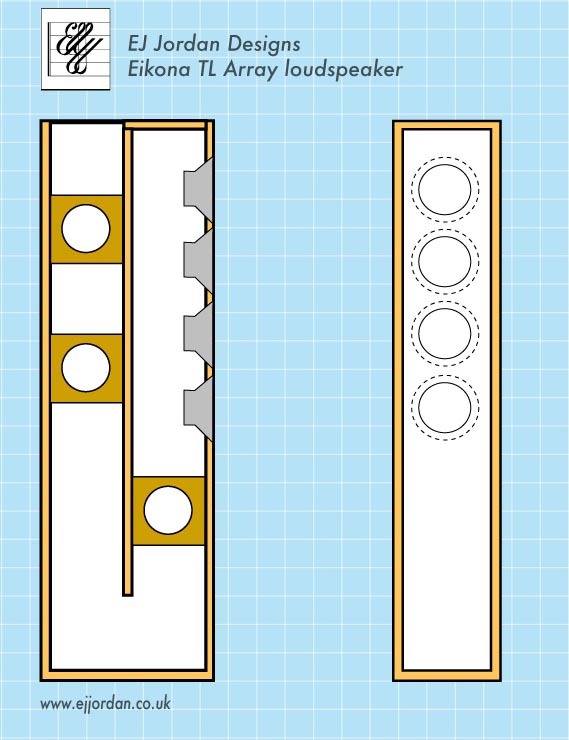 I reached the exact size by varying the cutter diameter in relation to the bearing, until I had two accurate templates. 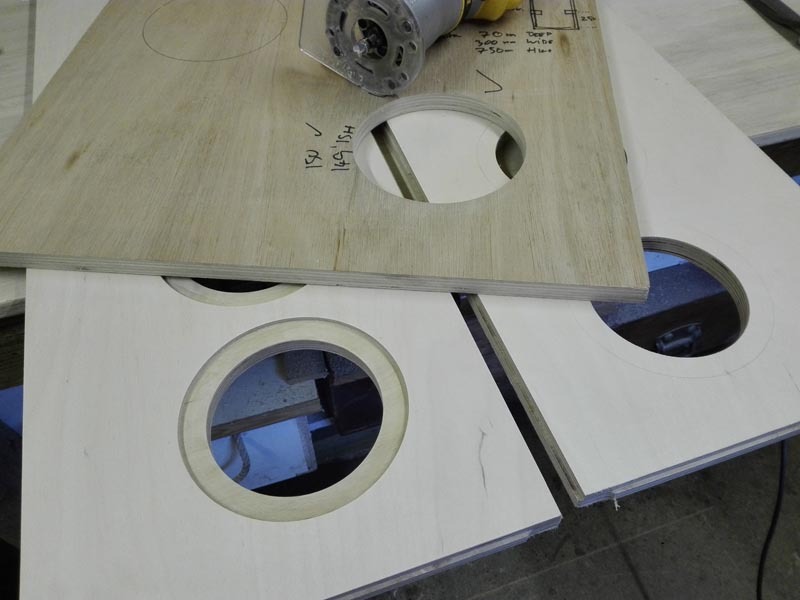 “The process of making the stepped cuts at first seemed complicated, but really a simple compass to mark the concentric circles is sufficient, lining up the templates on the baffle to these marks. I decided on 18mm birch ply for the cabinets – I’m no fan of MDF due to its dust. The ply is great to work with and offered the possibility of a reasonable finish without the need to veneer the cabinets. 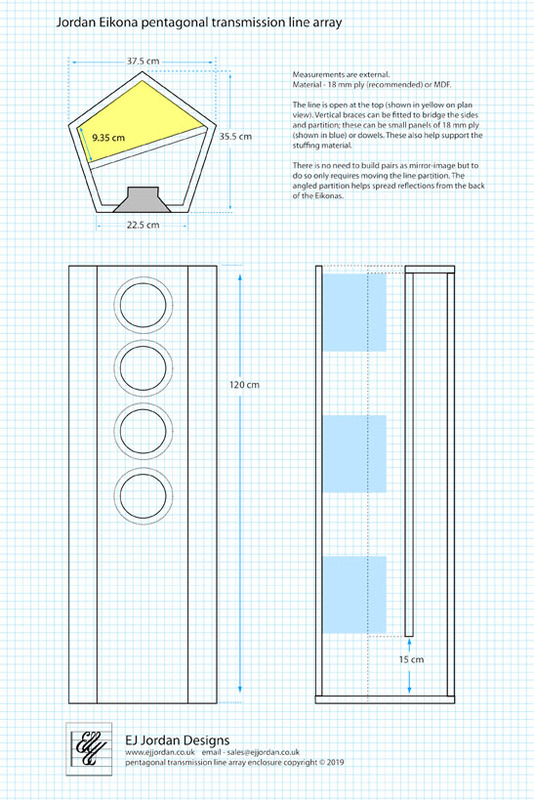 I deviated a little from the DCR plans but the internal dimensions are as recommended. The sides of my cabinets are wider, and stepped front and back. The back is built in two parts, so is 36 mm thick, and removable. The bottom section is sand filled. I rebated the joints, used glue and pocket hole screws for the assembly and it makes a strong cabinet. After about five coats of tinted Danish oil they were ready for the Eikona drivers and wiring! 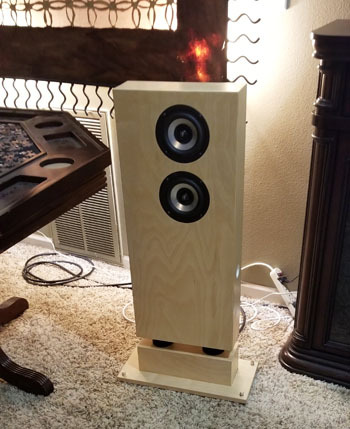 “Now I was ready to connect to an amp and finally hear some music. I’m fortunate enough to have a couple of amplifiers and combined with the option of either parallel or series connection to the two Eikonas in each cabinet, this gives a few different possibilities. “Never having heard speakers of this type before, I wasn’t sure what to expect. The expense and the time had been a bit of a gamble, and the first few minutes of music left me thinking I would need a while longer to figure these out. Well, over a week later I seem to have settled on series wiring (12ohms) and at the levels I listen, neither my 300b amplifier or modestly-powered solid state amplifier have any problems providing sufficient volume. We wish Martin many years of listening pleasure! For more details of the Eikona DCR, visit our DIY plans page. 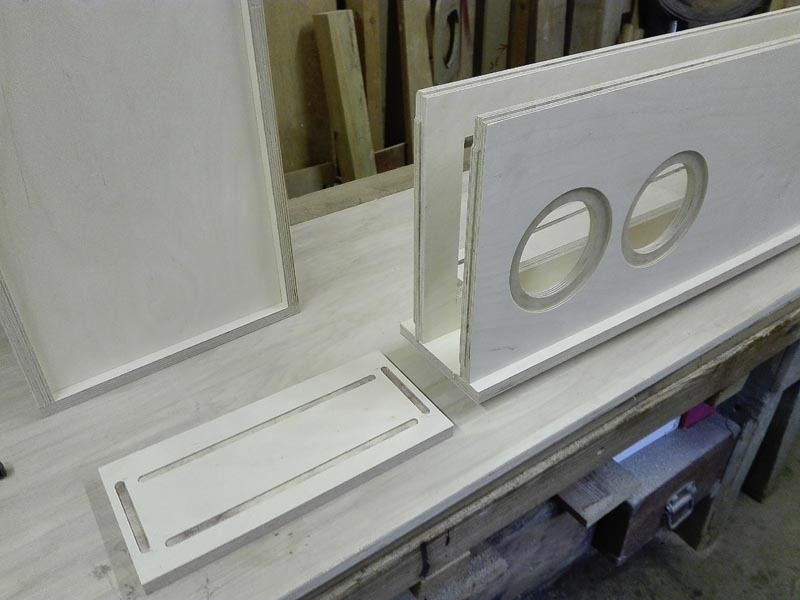 We are always happy to help our customers with any queries they may have when constructing their speakers. 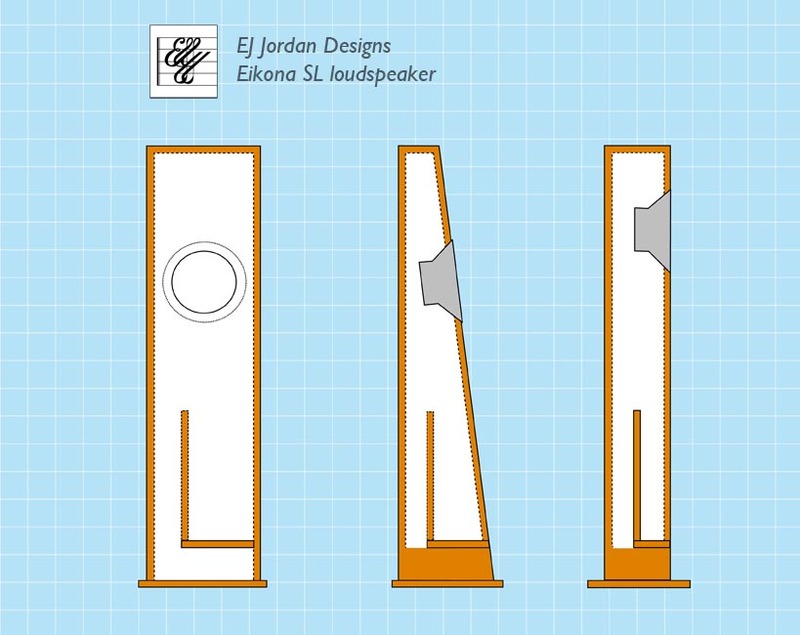 One of our most popular loudspeaker enclosures for the Jordan Eikona 2 is the MLTL30 transmission line, designed by Jim Griffin. We describe it in detail on our blog here. 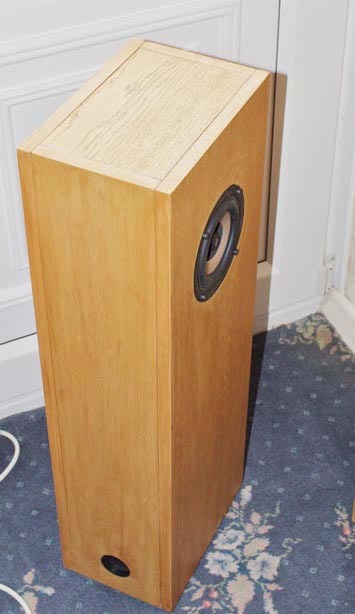 The MLTL30 is a relatively compact loudspeaker at 80 cm tall, 26 cm wide and 19 cm deep but is capable of impressive performance, producing bass to below 30 Hz in-room. Following Ted Jordan’s preference, Jim’s original design for the MLTL30 was adjusted to have a wider baffle than is common in commercial loudspeaker systems. We find that this lends extra weight to the mid and bass frequencies. However, if a conventional, narrow look is preferred, it is easy to adjust the ratio and make the size 21.5 cm wide and 23.5 cm deep. The cabinet height, driver position, and port size and position all stay the same, and the port can now be fitted to the front panel. 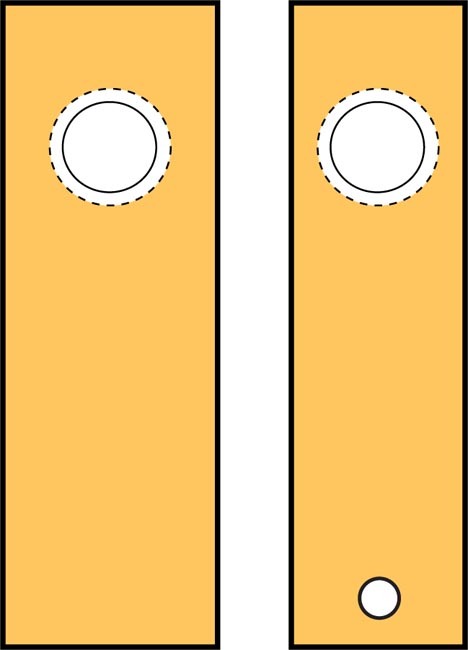 A sketch of the two sizes is shown below. The MLTL30 is an ideal compromise for those looking for a solid bass performance from a smaller cabinet. You can find our own MLTL30 enclosure plans here. Whilst digital audio broadcasting (DAB) and internet radio continue to spread into homes, there is no denying the allure of the classic FM stereo tuners and hi-fi receivers from the 1960s onwards. The best of them featured polished woodwork, brushed aluminium front panels, tactile controls and the attractive blue glow of the tuning dial. They also weighed a ton! If, like us, you feel drawn towards this kind of retro, there is a website just for you. 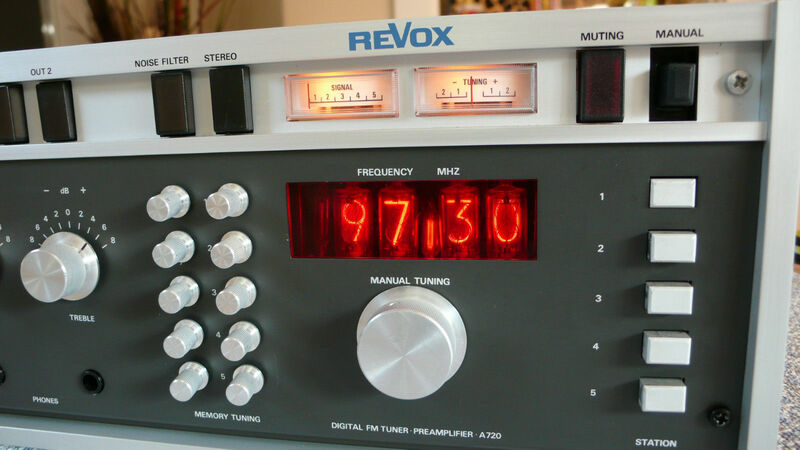 Classic Receivers is a blog devoted to vintage hi-fi receivers from the 1970s and 80s. It is based in the USA so the emphasis tends to be on classic Japanese receivers such as Marantz, Pioneer and Yamaha, but there is still a lot of interest for enthusiasts in Europe. The list of models is extensive and it is being added to all the time. There are comments about performance, from both the technical and subjective viewpoints, and examples of current second-hand values. It’s a fun and useful resource. Those of us in Europe might like to see more representation from this side of the pond. For example, classics from Norwegian specialists Tandberg, Swiss open-reel manufacturers Revox and, of course, Denmark’s Bang and Olufsen. So, is this something to be taken seriously? And which vintage hi-fi receiver would you buy? 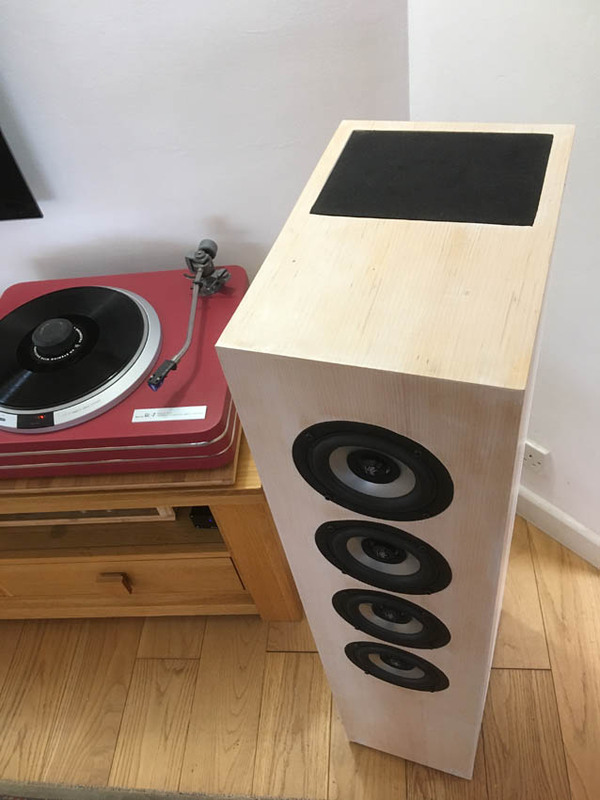 Simon Regan’s beautifully-crafted Eikona VTL speakers featured on our blog a few months ago so we were intrigued to see his latest creations. 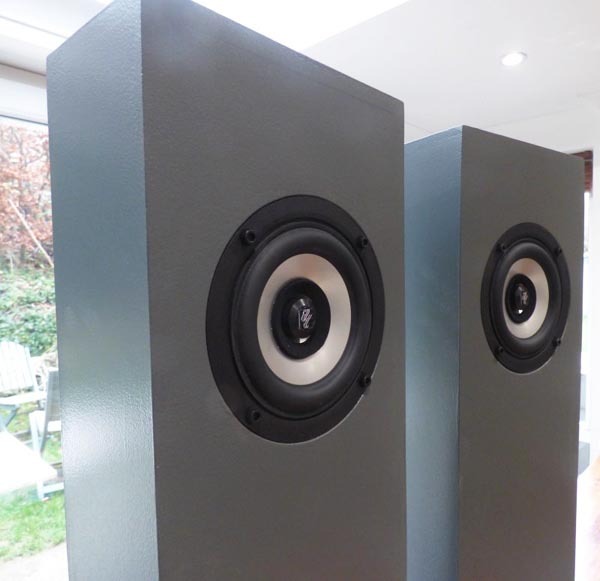 These are a pair of unusually-shaped, floor-standing loudspeakers, based on one of our Eikona MLTL (mass-loaded transmission line) designs. 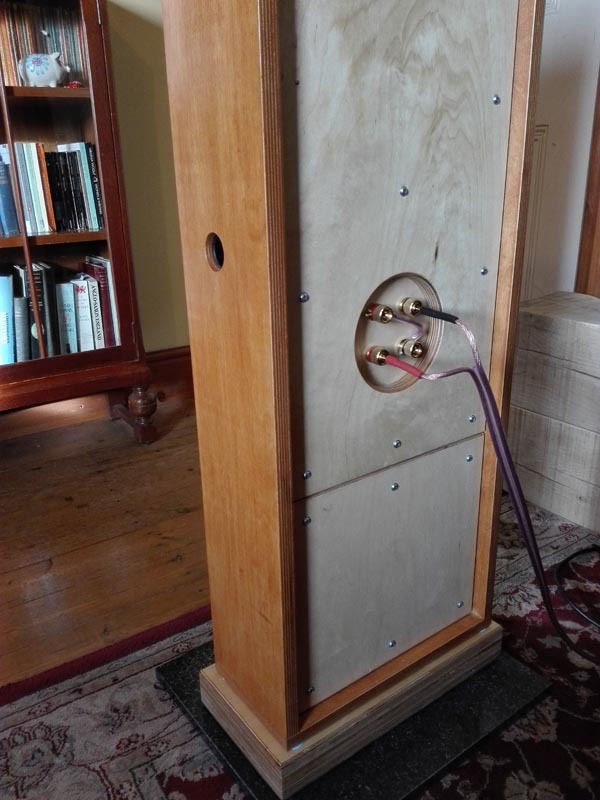 The cabinets have a pentagonal cross-section, designed to reduce internal resonances, and were commissioned by a customer after reading about Simon on our blog. Simon’s client, George Foster, belongs to the London Live DIY HiFi Circle. He has a history of using Jordan units, having built one of the original Jordan JX92 MLTL designs, and he felt it was a logical next step to try something similar with the Eikona 2. 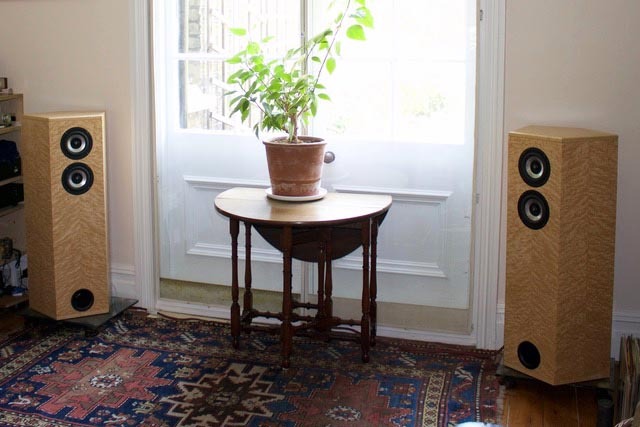 George experimented with pentagonal cross-section cabinets after hearing the well-known Pentachord speakers in the 1990s. He became convinced that reflective surfaces within enclosures were worth avoiding (something we have achieved with the Eikona Triangular Array). “I began with a single Eikona in the 35MLTL enclosure and then added a second driver, in the manner of the DCR. 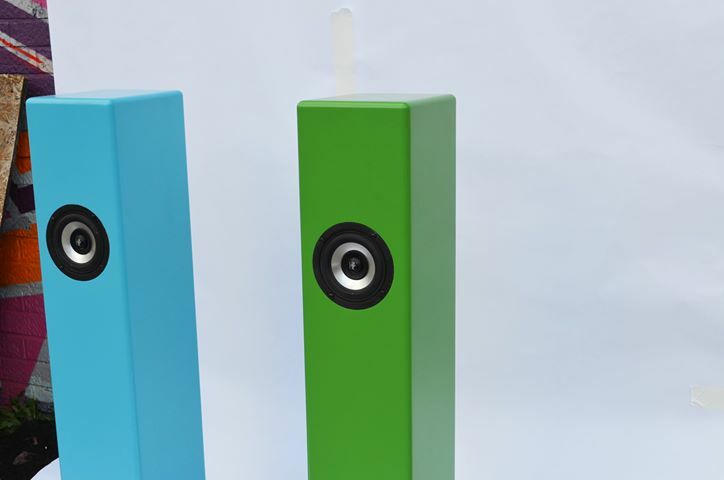 It made an enormous difference – I was surprised at how much fuller the sound became. The next step was to keep the same height but double the volume to 70 litres. Simon and I worked together on the plans, and he showed my wife and I a wide range of veneers. 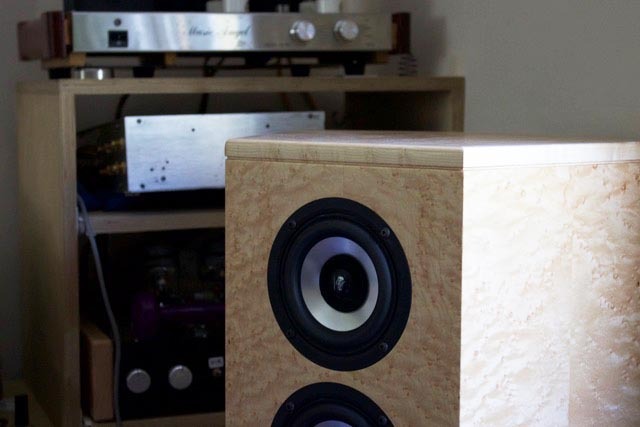 The resulting cabinets are of a much higher quality than my old ones – they look and sound very much better, and our choice of veneer fits beautifully with our living room. 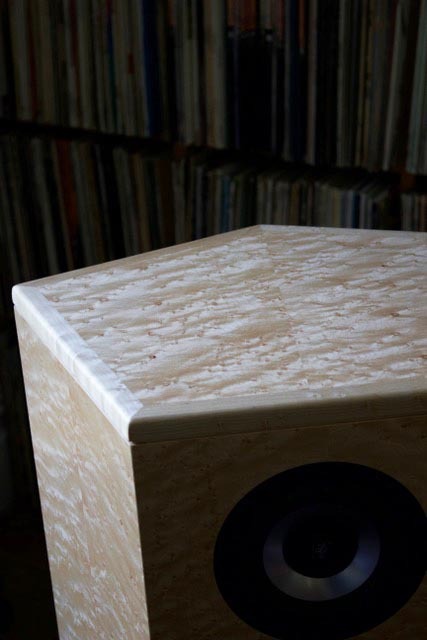 ”Initially, George wanted me to veneer his existing birch ply cabinets. For various reasons, I suggested that it would be better to make new cabinets. I was convinced that by the time I had worked on the existing cabinets (eg re-machining driver cut-outs and rebating the Eikona 2s), I could have made new ones. I also recommended having veneer on both sides of the board (inside and out) as it balances the wood and avoids warping in centrally-heated homes. George agreed and I was keen to make these look as good as they would sound. “George and his wife chose birdseye maple veneer, which I selected from Capital Crispin Veneer in East London. Buying it in leaves or strips allowed me to book-match the veneer consistently around the two cabinets. (This is a technique of creating patterns by using two sheets in mirror image to each other like the pages of an open book.) On veneered work, I like to use solid lippings – strips of solid wood – especially on edges which need to be particularly robust or require rounding over. Solid birdseye maple is difficult to find, so I made a trip to Timberline in Tonbridge, a specialist timber yard often used by lute and furniture makers. One thing to note is that birdseye maple can be a challenge to work with since you have to take great care with unpredictable grain direction. “Apart from the ports, I made sure the cabinets would be completely airtight and very rigid. Inside are a series of pentagonal braces each cut from a single piece of board, then hollowed out and tongue-and-grooved into the sides of the cabinets. Once glued, these added great rigidity and were also helpful when it came to assembly, where I wrapped the cabinet walls around the braces. I used an aerolite glue, which allows the longest time possible to assemble, adjust and clean up the cabinets before the glue sets. 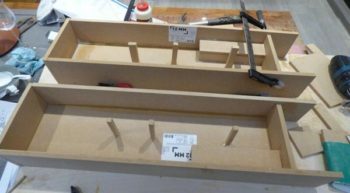 “Prior to gluing, I covered about 70% of the interior of the cabinets in Dedsheet material from Sound Service. As well as adding damping to the cabinet, it added a considerable amount of weight! I attached fine netting to the brace immediately beneath the bottom driver to stop the stuffing (long-haired sheep’s wool) from falling into the lower half of the cabinets. I finished the cabinets in three coats of a clear polyurethane lacquer. A clear satin finish really looks great on birdseye maple and brings out the detail of the grain. 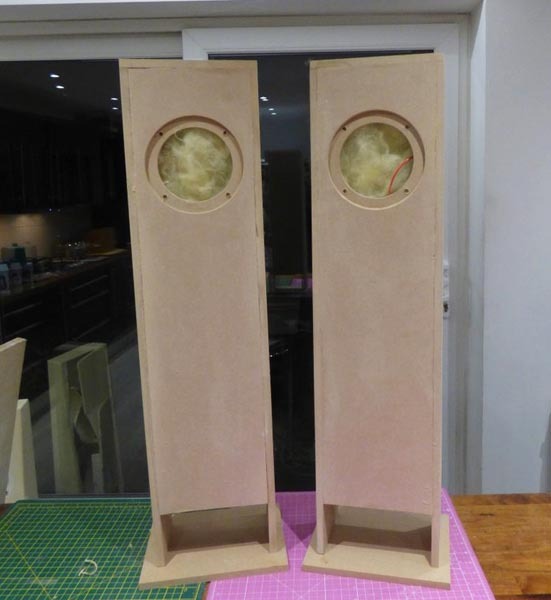 Simon is happy to work on other Eikona-based loudspeaker commissions. To see more of his work and to contact him direct, visit his website.